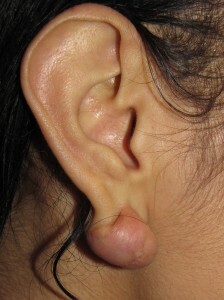 The earlobe and ear in general is probably the most common location for the formation of keloids and no racial group is immune to their development. Darker complected ethnic groups such as blacks and many Hispanics, have a much greater risk for their formation though I have seen them present even in fair complected individuals such as those of Irish and German descent. Unfortunately, keloids in this location can be quite conspicuous particularly when they have been allowed to enlarge to a substantial size. Most people with one find them quite unattractive and prefer to have them removed. Women in particular often alter their hairstyle in order to better hide them and even avoid wearing their hair tied back so as not to uncover their deformity. Keloids of the ear can range in size from a less than a half a centimeter to four centimeters or more. They can be single or multiple in number, with shapes varying from round to oblong, horseshoe and even to dumbbell where the keloid extends through the earlobe with an enlargement on both sides. 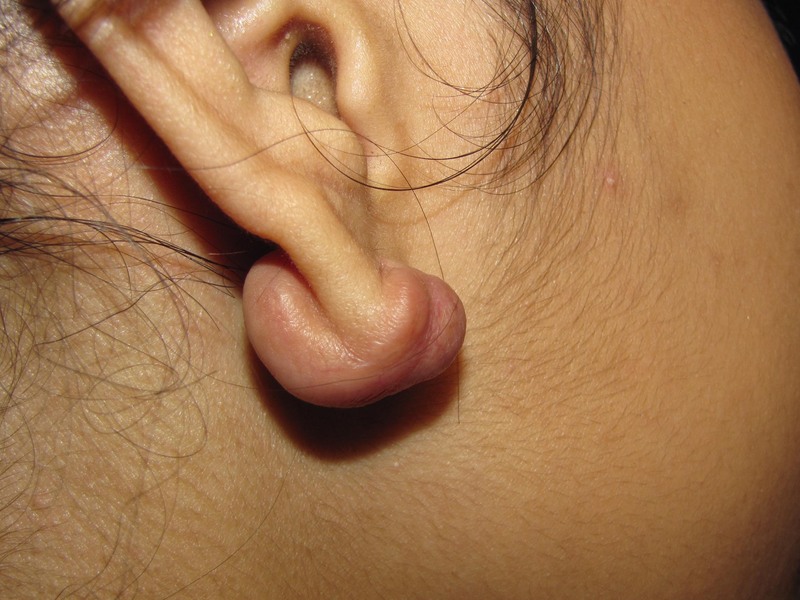 The following patient of mine is a fairly typical example of a person with a horseshoe shaped keloid, this one being of her right earlobe (Fig. A). Of half Native American decent, she has had this for four years, with it gradually increasing in size to now in excess of two centimeters (just under an inch). No treatment has been previously administered. She wanted it removed because of both its unattractiveness and its continuing enlargement. My recommendation to her was for its surgical removal, plastic surgery reconstruction of her earlobe, immediate aggressive steroid injection and close follow-up for at least one and a half years. She proceeded with the surgery and the steroid injection, which was quite effective in preventing any recurrence. 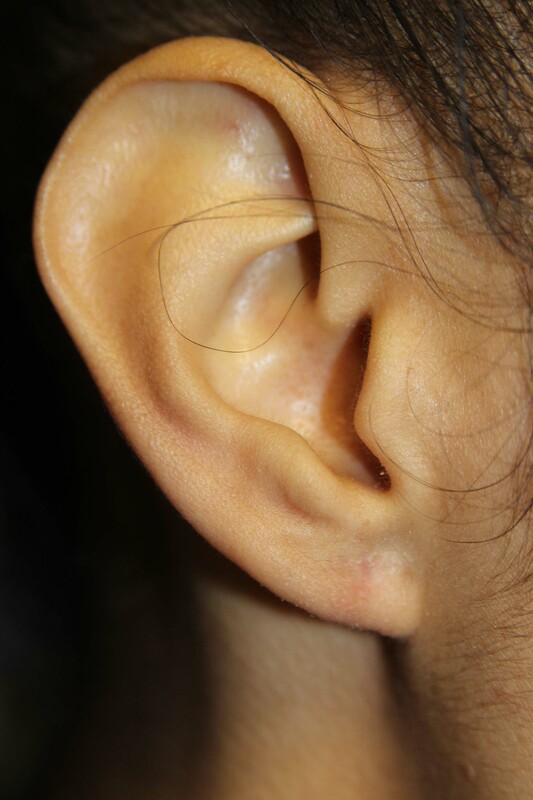 Her result at a little less than one year can be seen in Fig C.
Needless to say, she was very happy with the ultimate appearance of her earlobe and the lack of any regrowth of the keloid. If you would like more information on the treatment of keloids or for any other plastic surgery procedures that I perform or to schedule a consultation with me, please call my office at 480-451-3000.